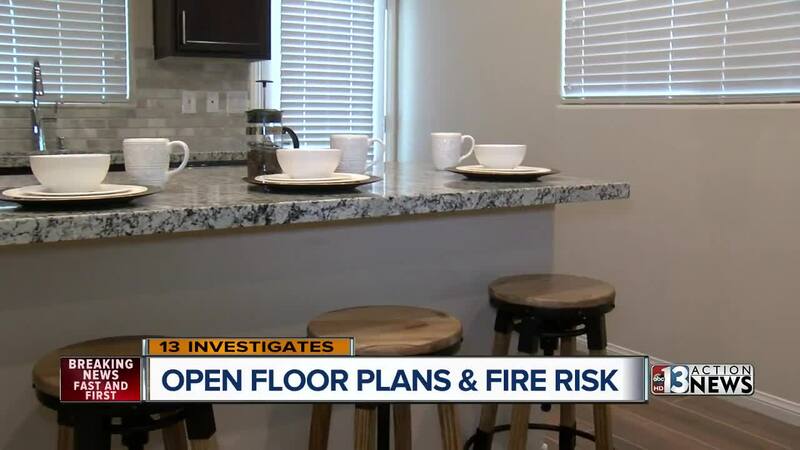 It has become a very popular trend in new home construction but fire experts say open floor plans can lead to explosive fire growth, leaving people with little time to escape. The open floor plan is known for eliminating walls between living spaces which gives a larger feeling for a home. Fire experts say the open air and available fuel are a mixture for explosive fire potential. "Fire requires, obviously, fuel and oxygen to grow," said Clark County Fire Department Batallion Chief Thomas Touchstone. "In a large, open floor plan, typically you have more fuel and oxygen which allows the fire to travel faster," added Touchstone. Touchstone teaches new firefighters about fire behavior at the Clark County Fire training facility. According to Underwriters Laboratories Firefighter Safety Research Institute, modern science has shown fire moves 7 times faster compared to 40 years ago in homes. The increased fire speed, experts say, comes from the synthetic materials which fill most present day homes, combined with the rise in open floor plans. Touchstone says homes with more walls seem to slow the spread of fire and smoke. "That wall will act as a heat-shield and prevent the fire from spreading through conduction from one room to the next but smoke is also fuel and according to the U.S. Fire Administration, the smoke actually kills more people than fires," explained Touchstone. The U.S. Fire Administration reports there were 3,280 fire-related fatalities in 2015 , the most recent data year available. Underwriters Laboratories has studied so called legacy construction fires compared to contemporary open floor plan fires in recent years. Researchers concluded synthetic material is the primary reason fires are moving faster but note open floor plans are helping fire and smoke to spread to other areas of modern homes. Experts say occupants of homes today have less than 3 minutes to escape, down from 17 minutes in 1980. "Open floor plans have become increasingly popular and prevalent in new homes here in Southern Nevada and nationwide for many years. We are not aware of any complaints from local homeowners or local fire departments about such designs posing increased safety risks." Fire experts stress the importance of working smoke detectors in every bedroom and level of a home and encourage everyone to close bedroom doors before sleeping.